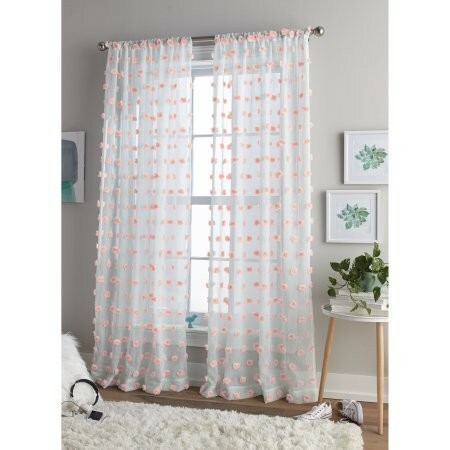 Better Homes and Gardens Dots Rod Pocket Panel Pair, Coral - 50" x 95"
Better Homes and Gardens Dot Panel is a unique sheer curtain for use in bedroom, nursery, or living area! Dimensional Puff Poms on a textured sheer ground are a light and lively way to show your unique style. 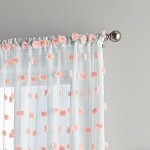 Textured sheer has 3" rod pocket for use on standard or decorator rod up to 1.25" diameter. PomPom Puffs add a unique dimension to the window. Panel is 50" wide. 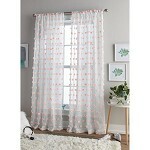 Polyester is easy care machine washable! Polyester is easy care machine washable.